This is a battered survivor. 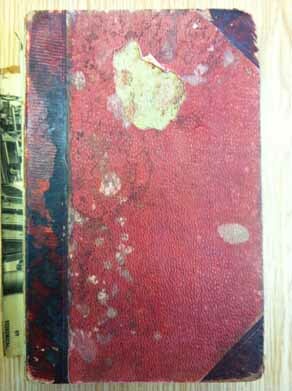 I acquired this much-annotated volume from the family of a retired British consular officer, J.F. Ford. Someone, I think Ford, has copied out from p.125 the phrase I use here in the blog title: ‘Narrow maxims of antiquity!’, turning it, with that exclamation mark, back on its author, F. M. Mayers, as a reflection on a particular vein of thought about Chinese culture. Joe Ford hardly shared that view. He joined the consular service in the 1930s, and was a Vice-Consul in Shanghai when Maurice Tinkler was killed in 1939. As I recount in Empire Made Me, Joe was despatched across the Huangpu river to Pudong, where Tinkler was held in the local headquarters of the Naval Landing party after after his altercation with Japanese marines in the China Printing and Finishing Company mill. In fact, Mr Ford can be seen in the grainy newspaper clipping on p. 285, peering at bullets recovered from Tinkler’s gun. Tinkler was at that stage slowly dying. Ford left without being able to persuade the Japanese to release Tinkler, and it was only late that night that he was transferred, too late, to a hospital in the international settlement. Ford was at least the third owner of this copy of William Fredeick Mayer’s The Chinese Government: A Manual of Chinese Titles, categorically arranged and explained, first published in 1877. This was a copy of G.M.H. 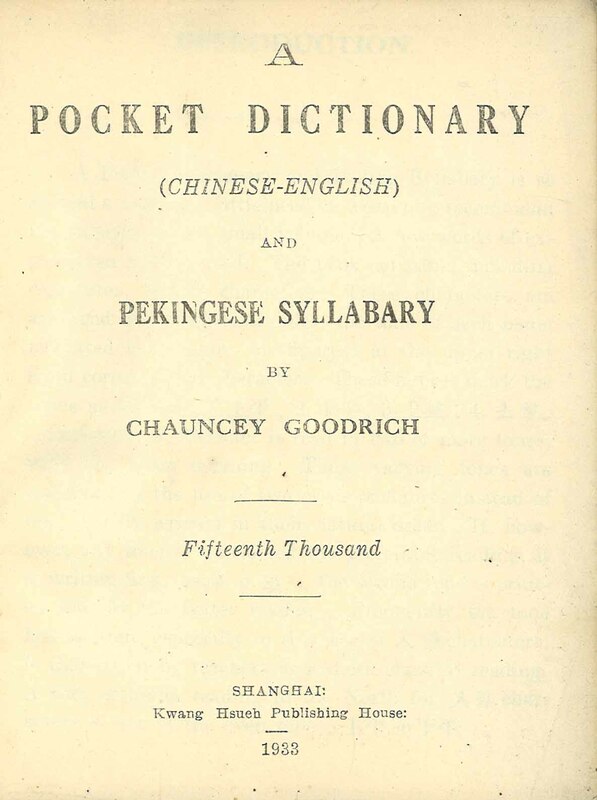 Playfair’s revised edition, published in Shanghai by Kelly & Walsh in 1897. While Ford had not inscribed his name in it, ‘L.G.C. Graham’ had, and so too had an ‘A. Schmidt’. Lance Gerald Cloete Graham was a ‘student interpreter’, a consular language trainee, who is not listed in P.D. Coates’s comprehensive survey, The China Consuls, but who is pictured in this photograph, dated 1900, of the consular student interpreters at the British Legation in Peking (second from left in the middle row), and in this one, with pony, in 1902. L.G.C. Graham was one of the few men transferred from the China consular service into the wider general service, leaving China in 1904. By 1906, however, he was at the British Legation in Tehran; in 1908 he was Acting Consul-General in Algeria. Perhaps his language studies had not proved that fruitful, although his son entered the China consular service, and later served in the 1950s as British ambassador to Libya. 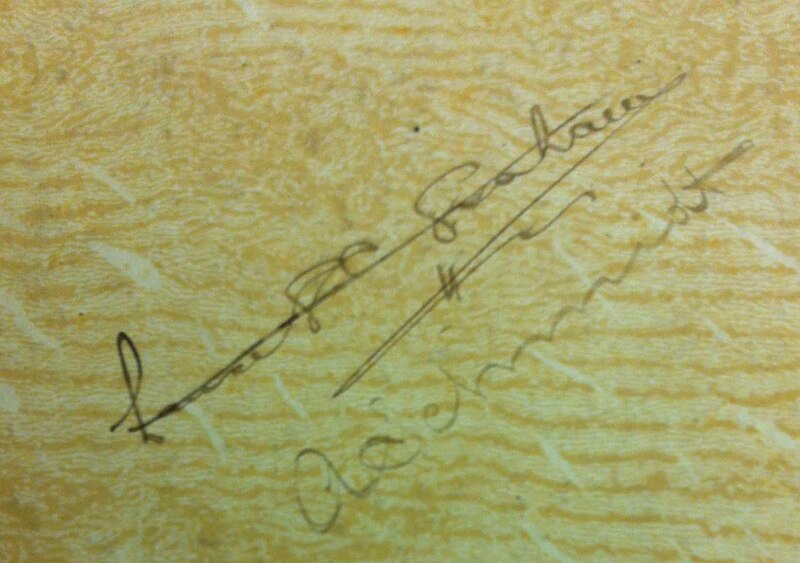 As likely as not the A. Schmidt who crossed out Graham’s name was a German member of the Imperial Maritime Customs. Schmidt had joined as a ‘Watcher’ in June 1882, and was one of a number of men transferred from the ‘Outdoor’ staff into the ‘Indoor’ staff by July 1896. He rose to be Deputy Commisisoner at Shanghai before his dismissal, with all other German and Austrian staff, in 1917. Schmidt woudl have needed Mayers’s guide to the structure of Qing government, its system of ranks and appointments etc. Schmidt was married to an Englishwoman, and surfaces in the North China Herald in connection with attempts to get sequestered funds released after 1918. They seem to have lived in Niuzhuang (Newchwang, Yingko) after 1917 at least, where Mrs Schmidt, sister of a British trader, William J. Lister, died on 17 June 1926. So the book seems to represent also the pre-war closeness of Anglo-German ties in China, an intimte relationship largely obscured by the First World War. Perhaps Joe Ford acquired the book when he too began his language studies in Peking in the 1930s, but it would have been of historical interest only in the republic. Like many consuls and customs men, however, Ford also developed a scholarly interest in China. In later life he worked with the late Professor Ying-wan Zheng on a project to translate into English the journal of Feng Ling, a ‘travelling naval observer’ sent to Europe in 1894-7. Feng spent over a year in Britain, and it was his British diary that the collaborators worked on. Ford came across the diary by chance on a road-side bookstall in Chongqing in 1944. It had been published in 1904 and then reprinted by Feng’s son in 1929. Mayers died long before Feng Ling set sail, falling fatally ill at Shanghai in 1878, en route from Peking where he was Chinese Secretary, to take leave in Britain. He was an ‘excellent Chinese scholar, a fluent and polished writer, and an indefatigable worker’, in the words of the North China Herald, part of whose legacy was this training manual for newcomers to the Chinese language and the Qing political system, passed on from consul to customs man, and back to consul, and perhaps held and used by others in between, a book which has clearly done service in its time. My books have travelled with me over the years, from secondhand shops the world over, through London and here to Bristol. But many of them had journeyed far before then, and had passed through other libraries. An occasional series of posts will explore the journeys of some of these. In 1991 I helped mediate the donation to the Archives at the School of Oriental and African Studies of the Scott family papers. The Revd Charles Perry Scott (1872-1927) was a founder of the Church of England North China Mission, based in Shandong province. He was the first Bishop of Shantung. The material included publications of the mainly Shandong-based mission, correspondence of the Scott family and others in the society, and also letters and diaries of Maurice Woodford Scott (1902-83) from his years working in China for Butterfield & Swire. Scott had been born in Peking, and had been sent to school in England before studying at Oxford university, and joining Swires as one of a new breed of university graduates the firm started to recruit in the early 1930s. Amongst the items not needed by SOAS library was this 1933 edition of a pocket dictionary, compiled by Revd Dr. Chauncey Goodrich (1836-1925) of the American Congregational Mission (whose grandaughter died just last year). It belonged to Maurice Woodforde Scott, whose initials are on the inside front cover. Scott would have needed a coat pocket to hold it in, but nonetheless the book has evidently been carried around by him. It has also been written in. There is little space in the book itself: its printed pages are crammed with entries and columns of characters, but on the inside and front covers and one blank page, we can catch glimpses of Scotts life and travels. Here is the Revd R.N. Bland’s address: ‘Sheng Kung Hui, Hengchow, Hunan’. An Anglican missionary, Bland was later curate at Camborne in Cornwall. Here is Mr Li’s address at Guangxi University in Guilin. Here is the name of a lacquer manufacturer in Fuzhou. They were perhaps met on trains, or on ships, as Scott travelled around. Someone has written in the name of the Tang dynasty painter Wu Daozi, someone else the note ‘江西省的会馆’ — Jiangxi guildhall — and another wrote a temple name, Fayuan si (as likely as not the temple of that name in Peking). Yet another hand has written 六郎斬子, the title of an opera, with the romanisation next to each character, including the tone mark. Most marvellous of all is Scott’s own attempt to write out the characters from a menu. 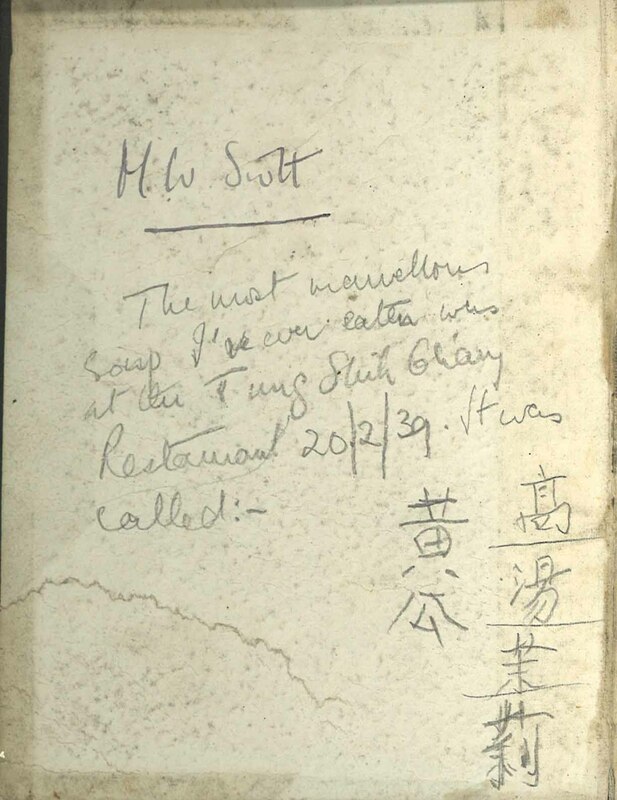 ‘The most marvellous soup I’ve ever eaten’, his note reads, ‘was at the Tung Shih Ch’ang Restaurant 20/2/1939. It was called:- 高湯茉莉黄瓜’. This was Gaotang moli huanggua: a jasmine flavoured cucumber soup, and Scott was probably enjoying a new year’s feast, for this was the second day of the new Chinese year of the rabbit. Where might the restaurant be? Scott served in a variety of postings for Swires, before he left, and later himself took holy orders and served as a clergyman in England. I suspect it was a restaurant in Peking. Scott’s shaky calligraphy was improved upon perhaps by a Chinese companion or host at the restaurant — for I think we can assume that the note was made at the table, with the taste of the dish still upon his tongue. On the opposite page the same characters are written out again by a fluent hand. The writer, evidently dissatisfied with the final word, 瓜, wrote it out yet again, in firm and very clear strokes. 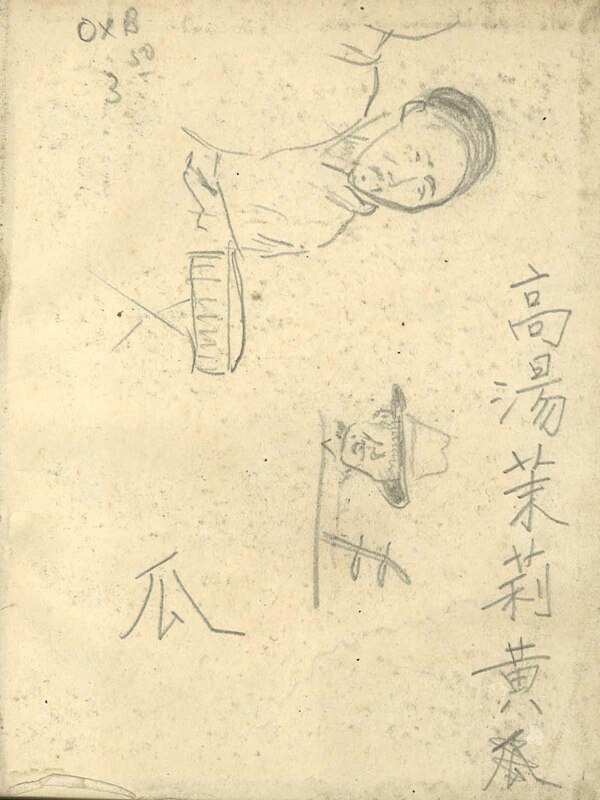 There too, on the same page, are a couple of sketches of Chinese faces, presumably also from Scott’s pencil. So in these few pages is caught a wonderful array of pieces of information that Scott, lacking a notebook, needed to copy down. On the hoof, in a restaurant, on board, waiting perhaps with time on his hands and but a pencil and dictionary to pass the time, Scott jotted things in it, or got others too. It serves as a record of encounters with food and language, people and culture. He notes where to buy lacquer, and perhaps which temple he should visit. The dictionary cost him $3.50. These are fleeting notes. Perhaps he wrote to Revd Bland and Mr Li; perhaps he visited the Fayuan si or the Fuzhou lacquer dealer, most likely not. Most likely he never again tasted Gaotang moli huanggua, ‘the most marvellous soup’, but perhaps in later life he turned the page and memory took him back to the Tung Shih Ch’ang restaurant and the delightful dish that he encountered as part of the new year celebrations on Monday February 20 1939.